≈ Comments Off on Are the Rich Getting Richer and the Poor Getting Poorer? Everyone has heard the chants and read the signs decrying the rich. The now dwindling and discredited occupy movement was ripe with such slogans, many of them coming straight out of Marxist literature. The ever vigilant Media was quick to repeat and even highlight each every complaint against the wealthy no matter how trivial. Of course the Media almost never tried to respond to the claims with real unbiased facts, that would have gotten in way of the story. The truth is in most downturns those with more usually lose more, this only makes sense since the more you have the more you have to lose. A line from the famous Song of the South says “Well, somebody told us Wall Street fell, but we was so poor that we couldn’t tell.” That may have been true for many in the poorest parts of America but it wasn’t for those jumping out of windows. Some may question if that is still true today, especially in the latest downturn. If the CBO is to be believed, which for purposes of facts if not prognostication it is usually pretty good, the latest downturn like those before hit disproportionately the most wealthy Americans. During the recession the top 1% lost 47% of their income while the bottom 20% lost just 2% on average. The fact is everyone lost but the top lost the most. The protesters and the MSM have continually tried to say that Wall Street has been benefiting off the backs of those on main street using the bank bailouts as proof. The fact is the economic downturn affected Wall Street as much as it did main street and more. Tens of thousands of jobs permanently disappearing since the crisis began, 110,000 in all and the trend is not over. The story of the wealthy getting wealthier off the back of this crisis has always been nonsense. The wealthy as a whole make money by creating wealth and skimming some of that creation for themselves. They take risk and create opportunities. Consequently if the economy takes a turn for the worse so does the lot of the country’s economic movers and shakers. This truth is ignored by those seeking political advantage out of economic tragedy. Truth is immaterial to those with an agenda to press. The reality is much of the rhetoric that has been spewed by leftest in the media and scrawled on signs of protestors is nothing more the warmed over communist gibberish. Ideas that find their basis in the long disproven notion that labor is the basis of all wealth. Meant to divide Americans along economic lines, the rhetoric ignores the facts to obtain a political upper hand. The fact is we are all in this together, as Kennedy said, “a rising tide lifts all boats.” Those that ignore this fact to wage class warfare harm us all. The top 1 percent carry 22% of the tax load, the top 20 percent nearly 70%. These are the same people that are also responsible for most of the employment in this country. This leads to another often ignored truth, an economic crisis always has its origins in the falling fortunes of the much maligned rich. Conversely it is through the investments of those with money and the entrepreneurial spirit of those with ideas that economic recovery is sparked. Those that seek to demonize the wealthy and tear down the successful in truth wage a war against all of society. By instituting oppressive taxation and restrictive regulations they tie the hands of those who would lead us out of the economic wasteland. A just as damning fact is that by making it ever more difficult to do business they create an ever widening division of the classes. Those at the top tend to stay there when competition from below is effectively squashed by a wall of taxes and regulations. In such an atmosphere about the only thing left for these class warriors is total economic cannibalization, or eating the rich as the signs say. 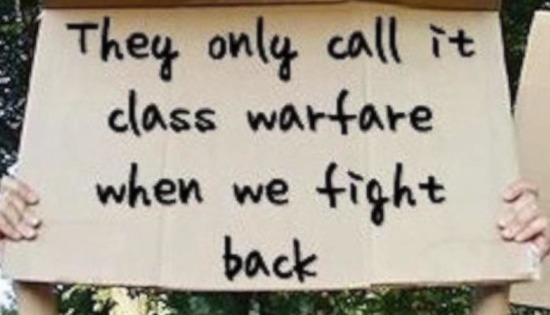 This is why Class warfare is in the end nothing more than a form of economic suicide. “an economy hampered by restrictive tax rates will never produce enough revenues to balance our budget just as it will never produce enough jobs or enough profits” J.F.K.